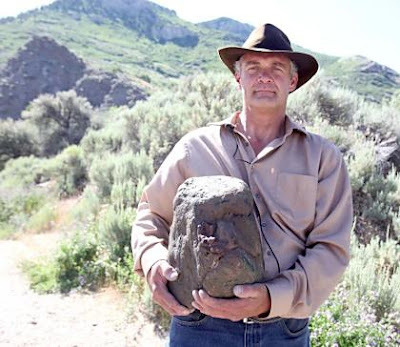 A man in Ogden, Utah named Todd May believes he's in possession of fossilized Bigfoot skull. May, a semi-retired” private investigator, discovered the "skull" near the mouth of Ogden Canyon about 6 weeks ago while looking for fossils. According to one paleontologist who examined the "fossil", the Sasquatch skull looks just like a rock. Ernesto: We really appreciate you taking the time to speak with us. Todd May: It’s my pleasure. Ernesto: Tell us, Todd, how does one go about searching for proof of Bigfoot? Todd May: Well, to tell the truth, I wasn't looking for Bigfoot when I made this discovery. Ernesto: What were you looking for? Todd May: The Muffin Man. Ernesto: I’m not sure I heard you correctly…can you speak up, please? Todd May: The Muffin Man, The Muffin Man. Todd May: Do you know the Muffin Man? Ernesto: Who lives in Drury Lane? Ernesto: What inspires you to begin such searches? Todd May: I smoke hydro and read The Book of Mormon. Todd May: Do you any more questions? Ernesto: No, you’ve said enough already, Todd.